Cut the avocados in half length wise; going around the pit. Take both hands and twist the avocado in opposite directions to separate. Take your knife and firmly hack the pit, twist, and it should remove easily. Take a spoon and scoop out the flesh of the avocado making sure to go although down to the skin. 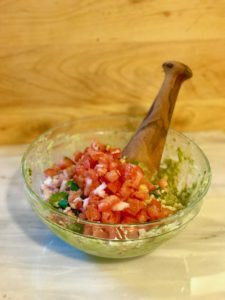 Place the flesh in a molcajeta/mortar and pestle or large bowl. 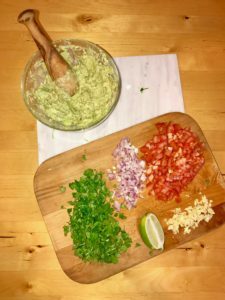 Take the pestle or knife (I’ve also used a potato masher or fork) and firmly mash the avocados to your liking (chunky or smooth). Add the remaining ingredients and gently fold until well incorporated. Taste and adjust accordingly. 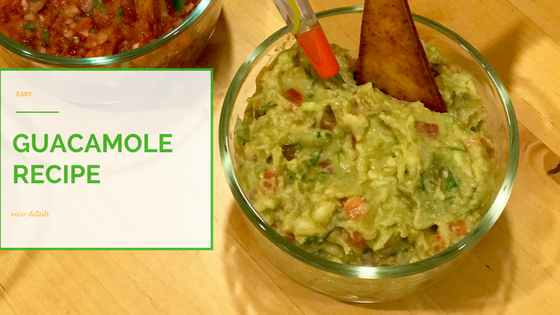 Let the guacamole chill in the fridge for about 1 hour to get best flavor. 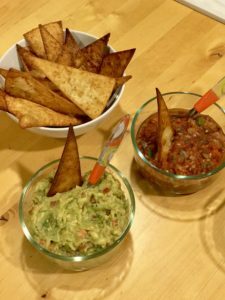 Place in a serving dish and serve with Snackin’ Free Tortilla chips (recipe here). If you are not serving this right away, cover tightly with plastic wrap and or place in an airtight container and place in the refrigerator. Guacamole has a tendency to turn brown upon sitting out. However, usually if you stir the guacamole it’ll revive itself. Gently squeeze the avocado, if it yields to the pressure then its ready, if it dents too much it’s overripe, and if barely gives in it’s not ripe and will be ready in 1-2 days.